Sushi roll recipes can inspire you to create a culinary work of art that is as pleasing to the eye as it is to the palate. Recipes include simple methods ideal for beginners, traditional methods and fusion style. Those looking for an easy gourmet seafood appetizer do not have to shy away from sushi. It is usually best to begin with recipes designed specifically for beginners; as you develop your skills, new challenges may emerge. The first step is to gather the right tools for the job, followed by the ingredients and finally the method. How to Make Sushi Rolls provides information about the necessary supplies as well as a step-by-step guide for creating sushi rolls ideal for beginners. Many commonly associate sushi with raw fish and vinegar rice, but this is only one variation. If the idea of eating raw fish is overwhelming, select sushi roll recipes that use other ingredients; there are many to try. It helps to know the difference between traditional sushi rolls and fusion style rolls when selecting recipes. Edomeaezushi (Edo style) are traditional sushi recipes that are surprisingly simple. The Edo style roll has only one main ingredient that the chef rolls inside seaweed, called nori. This traditional form focuses on the flavor of the main ingredient exclusively. Fusion style rolls have multiple ingredients, and they may have the sushi rice rolled on the outside of the roll (uramaki). Fusion style rolls may use as few as two main ingredients with intense focus on their flavors. Spicy tuna rolls use extremely fresh raw tuna combined with mayonnaise and Japanese hot pepper (togarashi). The ingredients are rolled with sesame seeds, nori and sushi rice. 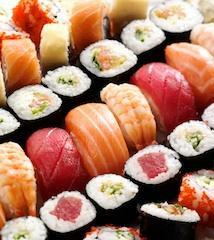 Common ingredients for sushi rolls include vinegar rice and nori. The base ingredients can combine with a countless number of other ingredients to create culinary wonders. Wasabi is a hot, flavorful condiment with a green hue. Soy sauce is dark, salty and rich with a watery consistency. Pickled ginger is an excellent complement for fish that has a warm, golden color. Mayonnaise is a surprising ingredient that may be used in spicy roll recipes. Sesame seeds are staples in sushi recipes that adds flavor, color and texture. Sushi is a form of art that relies heavily on visual presentation. It may take considerable time and practice to develop the skills it takes to create beautiful pieces of edible art; beginning with easy sushi recipes can help hone your skills. With patience and practice, you can master the art of creating sushi rolls.